The brother of a Muslim woman who was attacked in Toronto on Monday says she's been traumatized and "scarred for life" by what happened. The woman reported she was jumped from behind and beaten by two males while on her way to pick up her children from school. The brother of a Muslim woman who was attacked in Toronto on Monday says she's been traumatized and "scarred for life" by what happened. In an emotional address to reporters, the man, who didn't want to be identified, said his sister was punched in the stomach and face, called "a terrorist" and was told to go back home while she was being assaulted. 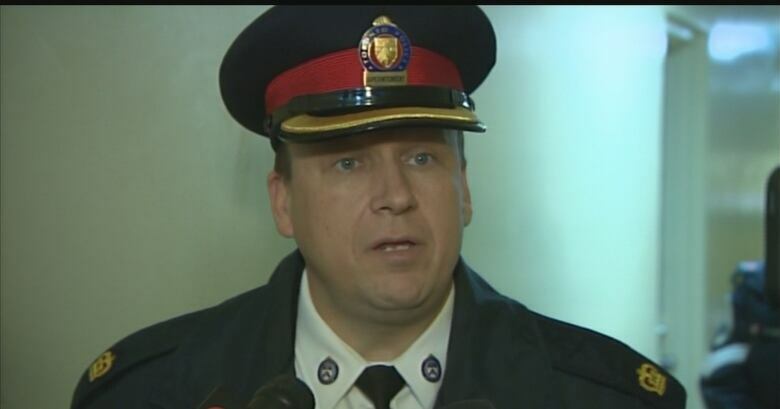 According to police, the incident took place at 3 p.m. in the Flemingdon Park area, which is southeast of Don Mills Road and Eglinton Avenue East, and investigators are treating the attack as a hate crime. The woman reported she was jumped from behind and beaten by two males while on her way to pick up her children from Grenoble Public School. The two approached the woman beside the elementary school, pulled her hijab aggressively and took her cellphone and some money before fleeing, police said. Supt. Mark Barkley called the attack "horrendous for the family that has to endure such a thing. "This should not be occurring," Barkley told CBC News. "This is a peaceful, innocent family that has done nothing and they were attacked. We're going to get to the bottom of this and make sure these people are apprehended." Barkley praised the community and said "it would get through this." "This is a very tight community, a good community, and it will remain such no matter what those certain individuals tried to do," he said. "They will not detract from this community." The woman's brother, who said the family came here more than 40 years ago, thanked the "tight knit community" for its support since the attack. "We will remain law-abiding citizens true to our religion of love and peace and forgiveness." he said. "These are the core values of our religion, which we'll continue to hold on to." Supt. Mark Barkley called the attack on the woman 'horrendous' and vowed that Toronto police would find those responsible. (CBC News)On Monday, Const. Victor Kwong said the woman was "punched all over and kicked" and added the two men hurled slurs that were "bigoted in nature" at her and tried to rip off her hijab. The woman fell to the ground in the attack. Kwong said the entire incident was seen by a witness who called police. The woman, whose name and age have not been made public, was taken to hospital with minor injuries and has since been released. Her brother said her children did not witness the attack. On Tuesday, the school sent a letter to parents and guardians acknowledging the "violent incident" and noted that support was available to any student who wished to talk. "Some students may be understandably upset," the letter from school principal Melissa Carson said. "Over the course of the next few days, teachers will also speak to students to reassure them and quell rumours." The letter also offered a list of "street-proofing tips" parents could review with their children, with suggestions like walking with a buddy to and from school. Police said anti-Muslim graffiti was found near the scene of the attack. "There was some graffiti written on a wall, something along the lines of Muslims not welcome," Staff Sgt. Smith noted. "We have no information right now to see that the two incidents are connected, but they did occur in the same area." The first suspect is described by police as a 30-year-old white man who stands five feet seven inches tall with a medium build and full beard. He was wearing a white checkered shirt and construction boots. A second suspect is believed to be a white male wearing a white hooded sweatshirt. This attack is the latest anti-Muslim incident in southern Ontario following last Friday's attacks in Paris. On Saturday, a mosque in Peterborough, Ont., was hit by arson in a suspected hate crime.